Released by Warner Home Video on DVD today, comes a documentary on the making of a classic – Gone With the Wind. Fans of this classic film, and those interested in the people and work put into making a film of this stature, will want to see this documentary. “Traces the filming of the imperishable classic Gone with the Wind, from its inception to its triumphant Atlanta premiere in December of 1939. Filmmaker David Hinton interviews as many survivors of the experience as he’s able to round up, but the main attraction of this film is its precious “test” clips. We watch a montage of screen tests of the many actresses considered for the role of Scarlett O’Hara, ranging from such front-runners as Paulette Goddard to such not-a-chancers as Lana Turner. The Goddard footage is particularly enjoyable as we watch her eagerly reciting the lines of all the characters as she auditions for Scarlett. 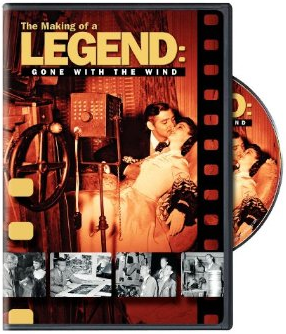 The Making of a Legend: Gone With the Wind is 124 minutes, in colour/B&W, and is rated PG.